The Flourish Award was established in 2009 by West Yorkshire Print Workshop to champion and showcase excellence in printmaking across Yorkshire. The award now provides artists and printmakers from across the UK with the opportunity to exhibit their work in a group exhibition at the WYPW Gallery. The winner of the award goes on to present their own solo print exhibition at Huddersfield Art Gallery in 2017. The winner also benefit from a two-week residency at WYPW. The Flourish Award is now open for entries! Grant Scanlon, Senior Curator, Kirklees Museums and Galleries. Submission fees apply: Standard entry fee for the Flourish Award 2017 is £15. For members of West Yorkshire Print Workshop entry is £10. The submission deadline for this year’s award is Monday 3 July. Click here for Rules & Regulations for entering the Award. Artists whose work is shortlisted will be invited to include their work in the Flourish exhibition held at West Yorkshire Print Workshop from 16 September – 28 October 2017. 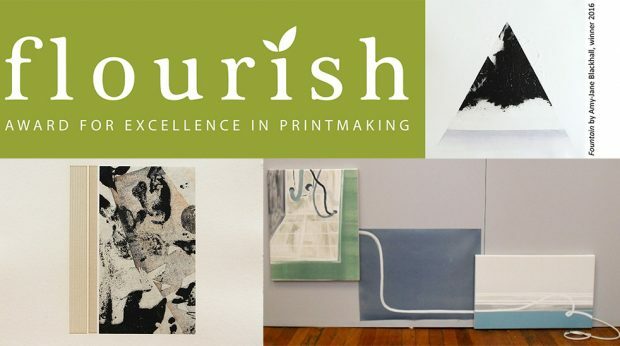 During the exhibition the panel of judges will select the winning printmaker – the Flourish Award Winner. In addition there are runners-up prizes; Jackson’s are again providing £100 worth of vouchers for our own prize as we did in the previous year. Click here for more information and to enter, artists can submit up to three works for a single submission fee. The artwork in the header image clockwise from R-L: ‘Fountain’ Carborundum with hand colouring 33 x 33cm by Amy Jane Blackhall, Winner of Flourish Award 2016 & Intaglio Printmaker Prize. Nadia Francis winning artwork which was awarded the Jackson’s Art Prize. ‘Inherited Guilt pt 2’ Mono print on canvas with oil paint and ink, 90cm x 170cm, 2015. ‘Infrastructure’ by Amy Jane Blackhall, Sugarlift etching & Japanese woodcut with laser engraving, 26 x 23.5cm.